While studying FFOZ’s Torah Club volume 4, Chronicles of the Messiah (a year-long, weekly commentary on the Gospels), this morning, I came across a few things I would like to share in regard to Yeshua’s Parable of the Soils. While this is typically known as the Parable of the Sower, I think his emphasis is more on the different types of soils than the sower. 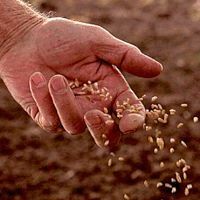 The sower and the seed are the same in every instance. It is only the different soils that affect how the seed is received. Meaning Only those who obey the message of the kingdom of heaven and persevere in it will endure to produce fruit for the kingdom of heaven. Where has the seed fallen in your life? What kind of crop are you producing?